From Left to Right: Ms Catleya Moya, Ayala Land Premier Residential Buildings Project Head; Mr Antonio Simbulan, PRSP Senior Partner; Mr Jose Sy, SY2 President and CEO; Mr Rodelito Ocampo, MDC Operations Group Head; Ms Meann Dy, ALI Vice-President and Strategic Landbank Management Group Head; Mr Jose Juan Z. Jugo, Ayala Land Premier Head. 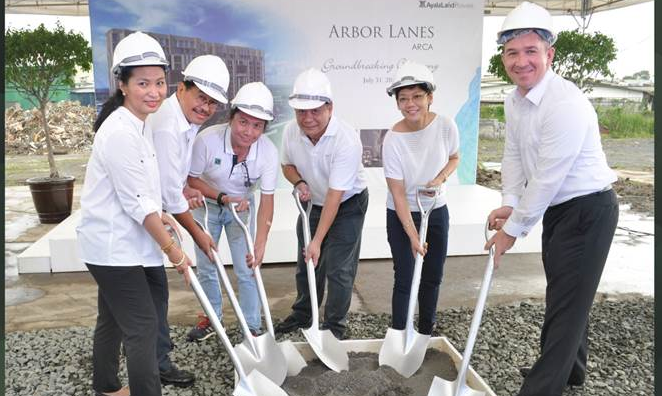 Last July 31, Arbor Lanes, Ayala Land Premier’s maiden residential project in Arca South broke ground. A 3.4 hectare development located in the east portion of Arca South, Arbor Lanes reveals a residential community embraced by intimate gardens and shared open spaces and boasts of a distinctive building orientation. Amidst inclement weather, ALP successfuly marked its first milestone event led by Mr Jose Juan Z. Jugo, Ayala Land Premier Head, and Ms Meann Dy, Ayala Land Vice-President and Strategic Landbank Management Group Head.